TI-SPE of the Guardia Civil Air Wing, at San Jose, Costa Rica. C-GGOR getting attention from Tom Johnson, at Lac du Bonnet, Manitoba. C-GVIX at Tyee Spit - CAE3, Campbell River, British Columbia. • 55-2355 United States Army Delivered 12th March 1956. Designated U-1A. Re-designated the 1st Aviation Company and moved to Fort Benning, GA.
57th Aviation Company at Fort Sill, OK., where it served until March 1963. August '63 it was assigned to the Panama Canal Zone. In February 1966 it is recorded as serving with the Intelligence & Security Command. July 1968 when it joined the Inter American Geodetic Survey (IAGS), also based in the Canal Zone but engaged on topographic survey work throughout Central and South America until April 1970. The following month it joined the 352nd Aviation Company, Southern Command, based at Albrook AFB., Canal Zone until February 1974. Incident:, Five miles southwest of Albrook AFB, Panama Canal Zone. 21-July-1972. On a VFR maintenance test flight, the pilot experienced severe engine vibrations at all power settings but managed to land safely. Incident: Near Albrook AFB, Panama Canal Zone. 09-October-1973. Again on a maintenance test flight, on climb out when passing through five hundred feet, the Otter was struck by a large buzzard, damaging the leading edge of the right wing, but the pilot managed to land the aircraft safely. • TI-SPE Government of Costa Rica under a Military Aid Program, for operation by the Guardia Civil Air Wing, based at Juan Santamaria Airport, San Jose, Costa Rica. • (C-GAOI) Aviation Labrosse & Fils, Montréal. QC. Reserved in October 1978 and received a flight permit for delivery to St.Jean Airport, near Montréal, QC. Howerer negotiations fell through and NTU. • C-GGOR Thomas Johnson, Lac du Bonnet, MB. dba Whiteshell Air Service Ltd., Regd 16-Mar-1981. Initially based at Nutimik Lake. Later based at Lac du Bonnet, MB from 1986. Re regd 02-Aug-1988. Canx 19-Jan-2005. • C-GGOR 3097448 Manitoba. Canx 17-May-2006 Ltd., (Adventure Air), Lac du Bonnet, MB. Regd 06-Apr-2005. Canx 17-May-2006. • C-GGOR Jackson Air Services Ltd., Flin Flon, MB. Regd 25-May-2006. Canx -04-Jun-2008. • C-GGOR Kississing Lake Lodge Ltd., Steinbach, MB. Based Flin Flon, MB. Dba Wings over Kississing, 04-Jun-2008. Re regd 18-Jan-2010. Canx 07-Oct-2010 & 08-Feb-2011. • C-GVIX Vancouver Island Air, Campbell River, BC Regd 08-Feb-2011. Otter 97 was delivered to the United States Army on 12 March 1956 with serial 55-3255 (tail number 53255). It was allocated to the 14th Army Aviation Company at Fort Riley, Kansas and was one of seven Otters which departed Downsview on delivery to the unit that day. In August 1956 the 14th was re-designated the 1st Aviation Company and moved to Fort Benning, Georgia where it continued to fly the Otter until 1961, when it converted to the Caribou, relinquishing its U-1A Otters to other units. 53255 was transferred to the 57th Aviation Company at Fort Sill, Oklahoma where it served until March 1963. After depot level maintenance, in August 1963 it was assigned to the Panama Canal Zone and it served there until February 1966. It is then recorded as serving with the Intelligence & Security Command until July 1968, when it joined the Inter American Geodetic Survey (IAGS), also based in the Canal Zone, but engaged on topographic survey work throughout Central and South America. 53255 flew for the IAGS until April 1970 and then went into storage in the Canal Zone. In September 1970 it joined the 352nd Aviation Company, Southern Command, based at Albrook AFB, Canal Zone. While flying for the 352nd it features in a few incident reports. On 21 July 1972, five miles southwest of Albrook, on a VFR maintenance test flight, the pilot experienced severe engine vibrations at all power settings but managed to land safely. On 9 October 1973, again on a maintenance test flight, on climb out when passing through 500 feet, the Otter was struck by a large buzzard, damaging the leading edge of the right wing but it landed safely. It continued to fly for the 352nd until February 1974. 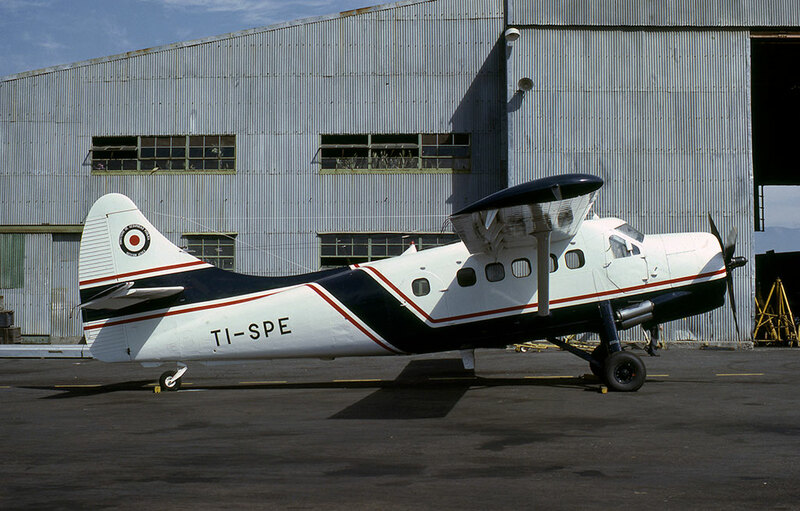 The following month, March 1974, 53255 and the other two Otters which had been operated by the 352nd Aviation Company (serials 100 and 225) were transferred to the Government of Costa Rica under a Military Aid Program, for operation by the Guardia Civil Air Wing, based at Juan Santa Maria airport, San Jose, Costa Rica. All three Otters were flown to San Jose, where they were re-painted in the Guardia Civil’s blue and white colour scheme. All three were registered to the Guardia Civil in March 1975, 53255 as TI-SPE, 53258 (100) as TI-SPF and 76107 (225) as TI-SPG. Word of the arrival of these Otters in Costa Rica had evidently reached Canada, as soon offers to purchase the aircraft were being made. Air Alma Inc of Alma, Quebec were so confident of having “clinched a deal” for the aircraft that on 19 March 1975 they reserved Canadian registrations for the three – C-GAOG for TI-SPG (225), C-GAOI for TI-SPE (97) and C-GAOJ for TI-SPF (100). The proposed purchase however did not proceed and all three aircraft entered service with the Guardia Civil. Air Alma lost interest, but Aviation Labrosse & Fils Inc., of Montréal then entered into negotiations with the Costa Rica government to try and buy the Otters. On 4 January 1978 they received a letter from attorneys acting on behalf of the government that it was still interested in selling the Otters, but had been very busy and could not advance the negotiations. The talking continued and in October 1978 Aviation Labrosse & Fils were evidently so confident of having purchased the aircraft that they too applied for Canadian registrations. 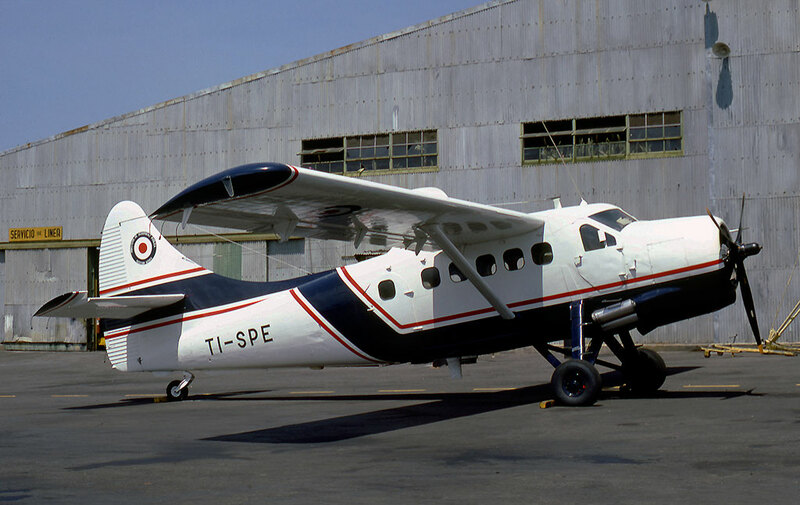 By that stage TI-SPF had been written off (it crashed in Costa Rica on 28 October 1977) and Air Alma confirmed they were no longer interested, so on 4 October 1978 C-GAOI was allocated to Aviation Labrosse for Otter 97 (TI-SPE) and C-GAOJ was allocated to them for Otter 225 (TI-SPG). They also received a Canadian Flight Permit for Importation for a flight by both aircraft from San Jose, Costa Rica to St.Jean Airport, near Montréal. At that stage TI-SPE had 5,549 hours total time, and TI-SPG had 4,338 hours. Again, the negotiations collapsed and both Otters remained in service with the Guardia Civil in Costa Rica. They continued in service until finally in 1980 the Costa Rican government did decide to sell the Otters. The buyer was Thomas Johnson of Lac du Bonnet, Manitoba. He purchased the two Otters as well as two Cessna 185s, one Cessna 180 and a Piper Apache. He rounded up the required number of pilots, they travelled down to San Jose from where all the aircraft set off together for the long delivery flight to Canada. They all used Canadian ferry marks and comprised Otters C-GGOR (ex TI-SPE), C-GGON (ex TI-SPG), Cessna 180 C-GGOJ (ex TI-SPA) and Cessna 185s C-GGOH (ex TI-SPC) and C-GGOP (ex TI-SPD). Mr Johnson himself was flying one of the Otters. The pilot of the other Otter became ill while they were flying over the jungle but fortunately they found a jungle strip and landed. Later they continued on, landing at Managua inn Nicaragua. The Apache was left there and the Otters and Cessnas continued on via Mexico-Brownsville, Texas-Wichita, Kansas to Winnipeg. All five aircraft arrived in Winnipeg on 27 April 1980. At Winnipeg the Otters were overhauled and registered to Mr Johnson’s company, Whiteshell Air Service Ltd, C-GGON on 13 May 1980 and C-GGOR on 16 March 1981. At first the Otters were based on Nutimik Lake but in 1984 they moved to the airfield at Lac du Bonnet, where Whiteshell Air Service had its hangar and offices, and which was adjacent to a river from where the Otters could operate on floats. Both Otters were painted in Whiteshell Air Service’s blue and white colour scheme with red trim. Whiteshell Air Service flew the two Otters, one Beaver and two Cessna 185s, to access fishing lodges, outpost cabins, tent camps and boat caches which it ran in three of Manitoba’s parks – the Whiteshell Provincial Park, Nopiming Provincial Park and the Great Atikaki Wilderness Park. As the company’s website promised: “Whether you are seeking your first fly-in fishing trip, a sightseeing trip or a remote canoeing experience, Whiteshell Air Service can provide the air transportation for all your needs”. The Otters were also available on wheel-skis for charter during the winter. The end of an era came at the conclusion of the summer season in October 2004. 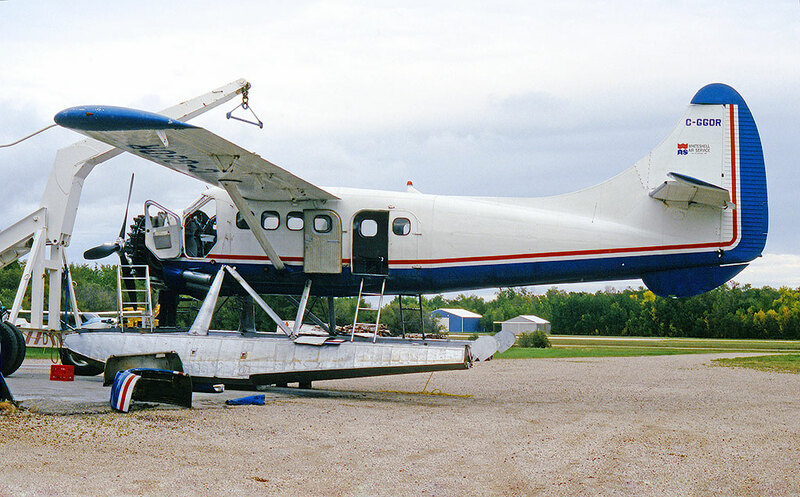 After 23 years of operation, Whiteshell Air Service retired its Otters and was closed down. C-GGOR (97) was put into winter storage at Lac du Bonnet as usual and was put up for sale. C-GGON (225), not yet rebuilt after an accident in May 2003, was also offered for sale. The registration of both Otters to Whiteshell Air Service was cancelled on 19 January 2005. Both aircraft were purchased by Adventure Air (3097448 Manitoba Ltd) of nearby Silver Falls, Manitoba. C-GGOR was registered to Adventure Air on 6 April 2005 and for summer 2005 went on lease to Jackson Air Services of Flin Flon, Manitoba who already operated a number of Otters, some of which were flown on behalf of fishing lodges. 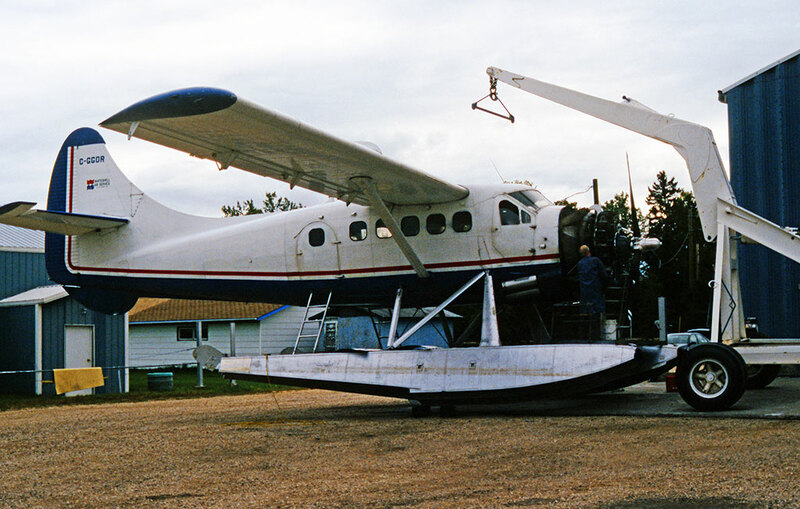 For summer 2005 Otter C-GGOR was operated by Jackson Air Services on behalf of Gangler’s Lodge, a fishing lodge on the North Seal River in northern Manitoba. In addition to the main lodge there were four outpost lodges and seventeen fly-out lakes, so the Otter was kept busy that summer flying the Lodge’s guests. At the end of the season Jackson Air Services bought the Otter and arranged to have it converted to a Vazar turbine. The work was carried out at Jackson’s Flin Flon base during the winter of 2005/06 and the Otter was registered to Jackson Air Services on 25 May 2006, in time for the summer season. It retained the same colour scheme as it had with Whiteshell Air but carried Ganglers titles. It was again in store at Flin Flon over the winter of 2006 / 2007. In spring 2007 Jackson Air Services sold its Flin Flon float plane base as well as the business carried on there to Kississing Lake Lodge Ltd. This is a company which operated a fishing lodge at Kississing Lake, some seventy miles north of Flin Flon, as well as other fishing camps in northern Manitoba. It had an associated aircraft operating company called Wings over Kississing, with a fleet of aircraft to fly guests to the lodges and to outlying lakes, but those aircraft were also available for charter, both summer and winter. As Jackson Air Services were getting out of operating Otters, the company’s two Otters C-GGOR (97) and C-FFVZ (145) were leased to Kississing Lake Lodge, for operation by Wings over Kississing, where they joined a fleet of a Cessna 185, Cessna 206, two Beavers and two Norsemen. Kississing Lake Lodge would eventually buy these two Otters from Jackson. C-GGOR was registered to Kississing Lake Lodge on 4 June 2008 and C-FFVZ was registered to them on 28 May 2009. 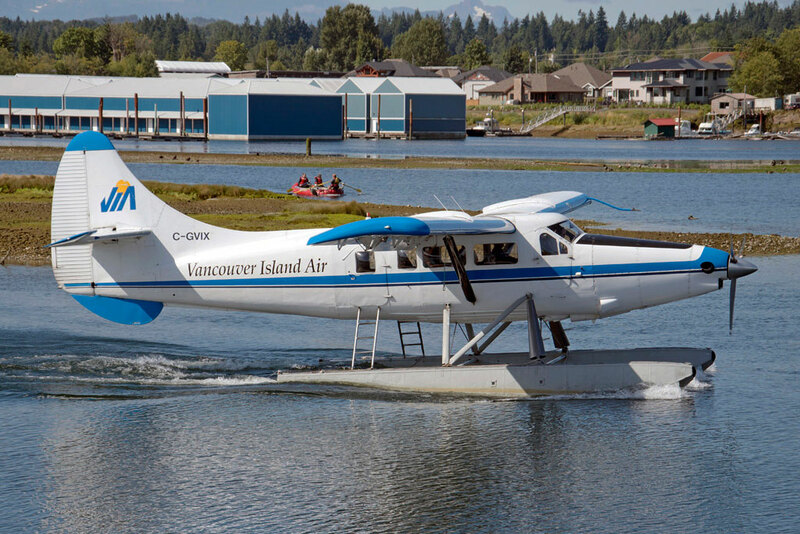 Wings over Kississing also took over operation of two more Otters C-FWEJ (208) and C-FODW (403), owned by Wollaston Lake Lodge but which Jackson had operated on behalf of the Lodge. From then on, Wings over Kississing would fly these Otters on behalf of Wollaston Lake Lodge. For the summer of 2008 Wings over Kississing operated Otter C-GGOR on behalf of Gangler’s Lodge. It features in a CADORS report for an incident on 27 June 2008: “Edmonton Centre received a ‘Pan’ message which was relayed from a Lufthansa flight that an Otter owned by Kississing Lake Lodge was stuck on a lake in northern Saskatchewan with a damaged float. The pilot requested Centre to call Gangler’s Lodge and advise of the situation. It was reported that the float was subsequently pumped out and the aircraft returned to the Lodge”. At the end of the summer 2008 season the Otter, as usual, was put into winter storage at Flin Flon. It was advertised for sale in January 2009. It had at that stage 14,660 hours on the airframe and an asking price of CAD$1,395,000. The sellers were “motivated for a reasonable offer and/or a Beaver in trade”. A sale proved elusive however as the market was poor and there were a number of other Otters also on the market. C-GGOR would remain parked at Flin Flon for nearly two years and it was not until 7 October 2010 before the registration of Kississing Lake Lodge was cancelled, at which stage the Otter was flown to the Vancouver International Airport for its new owner, Harbour Air, who made it available to Vancouver Island Air, to replace Otter C-GHAG (214) which had been damaged in an accident on 18 November 2010. Over the winter of 2010 / 2011 C-GGOR was overhauled by Harbour Air at the Vancouver International Airport and re-painted into the colour scheme of Vancouver Island Air (VIA) and went on lease to VIA. It was re-registered to VIA as C-GVIX on 8 February 2011 and it arrived at Campbell River, on Vancouver Island, its new base, on delivery to VIA on Saturday 26 February 2011. It entered service with VIA on its schedules and charters alongside Beech 18 C-FGNR and a Beaver. Kuyoqot on the northwest coast of Vancouver Island is in a wilderness area, except for a few logging camps. It was here in early July 2012 that C-GVIX hit a buoy in the harbour, damaging the engine and propeller. The Otter was taken to Vancouver for repair and was out of service for eight weeks over the busy summer period. During this time VIA relied on their trusty Beech 18 and help from Corelair’s two Beavers. Otter VIX was back in service with VIA from early September 2012. In December 2013 it was joined by turbine Otter C-FQND (233) which VIA had acquired and the Beech 18 was retired from the fleet. 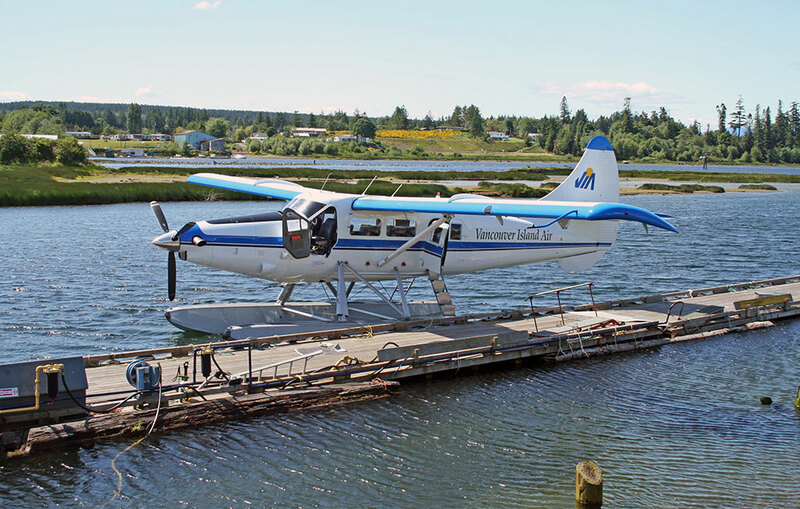 Since then Otters VIX and QND have flown the VIA schedules and charters from their Campbell River base.